EDMONTON - Ryan Jones couldn't keep it to himself. "I'm really excited. It's no secret that I love being in Edmonton and love playing for Edmonton," Jones stated moments after the one-year deal became official. "Going into this free agency, our main priority was to get a deal done back with Edmonton and I'm extremely happy and glad to have got that done." 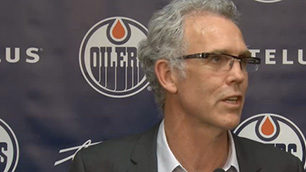 Jones joined the Oilers during the 2009-10 season and has made the city his home over the past three years. "It's a great place. A great city with passionate hockey fans and a culture built around the hockey team that anybody would be lucky or blessed to play for. I left a little bit to be a desired last year and I wanted to come back and redeem myself and prove to people that I still have a ton of game left in me." Jones had scored 18 goals in 2010-11 and 17 goals in 2011-12 but only had a pair this past year in 27 games -- his season was cut short by an eye injury suffered in late December. "The eye injury left me a little bit tentative on the ice and that's not a game that I can play," said Jones, noting that he had personal goals in mind for next season. "I need to become a menace when I'm out there, be hard to play against, always be around the net and just be a guy that when the other team leaves the ice they don't enjoy when you're out there. That's one thing I'm going to work hard at this summer is get into physical condition to be able to do that and when next year comes around I'll put it in my mind that that's player I want to be and that's the player I need to be to help this team move forward." The feisty winger added that the style of play was key and felt that the numbers would be there if he made himself tough to play against. "Just because of the nature of where I play -- going to the net -- the goals will kind of come but I'd like to return statistically-wise to the good years that I had with this team two or three years ago. Even though there was interest around the League in Jones' services, Edmonton was always his chosen destination. "There were options in the East and West. Ultimately, the organization wanted to weigh their options and see what was out there and at the same time so did I. But Edmonton was always where I wanted to be." The Jones signing is just the latest in a number of moves that the team has made over the past two days. The club added seven players on Friday and have now added three more today including goaltender Richard Bachman and defenceman Lee Moffie (trade with San Jose). "MacT said he was going to come in and make some moves and he's stood behind his words," Jones noted. "That's one thing I've heard about MacT from people outside is he doesn't bluff. When he says something, he means it whether it's positive or negative and he's stood behind that. They've brought in some great hockey players from all around the League. I'm excited to be a part of it and excited to play with those guys." As far as looking ahead to the upcoming season, Jones said the goal was simple. "For the team our main goal is to get in the playoffs because we've said all along the past couple of years that when you get there you really never know what's going to happen. Take this team for an example when they went to their Cup run. They were the last team in the playoffs and went all the way to Game 7. That's gotta be the main goal to get there."